It is time for Corrib Ramblers to look back on another very successful year of walking and camaraderie. Thank you to everyone for their friendly and energetic participation, and to many for their specific contributions, particularly to those who organized and led the walks, who provided after-walk refreshments, and who made all those really important unheralded contributions such as car-pooling, encouraging new members, and helping fellow walkers when they got into difficulty. I am not supposed to mention names, but most of all, a big thank you to our fearless leader, Joe Murray, who has yet again worked so hard in his diplomatic way to keep the wheels of the club turning so well. The attached table [Which can be downloaded at the bottom of this page] summarizes the walks of 2017. There were 49 regular Sunday walks during the year, undertaken by the 31 paid-up members of the Club, and their numerous guests, including 3 new members in 2017. Average participation per walk was 13 with a maximum of 22 and a minimum of 1. The highest monthly turnout rate was an average of 18 per walk for the month of May. In addition to the regular Sunday walks, there have been more than 20 additional walks, most notably the 10-day trip to France and Spain for the Camino in September, the Summer Weekend Away in Westport in June, the Christmas Party Weekend in Clifden, and many mid-week walks organized for various purposes such as reconnaissance for a future walk, training for the Camino, or simply just to try something new while getting in extra walks. creative – many exciting new walks, even close to home. feeding of donkeys – observed on numerous walks, some members seem to specialize in this sharing of lunch food. flexibility – the location and/or leaders of walks were successfully changed at short notice, where this was necessary. Also, many walks were designed so that slow walkers and fast walkers could take different routes, but still end up at the same spot. 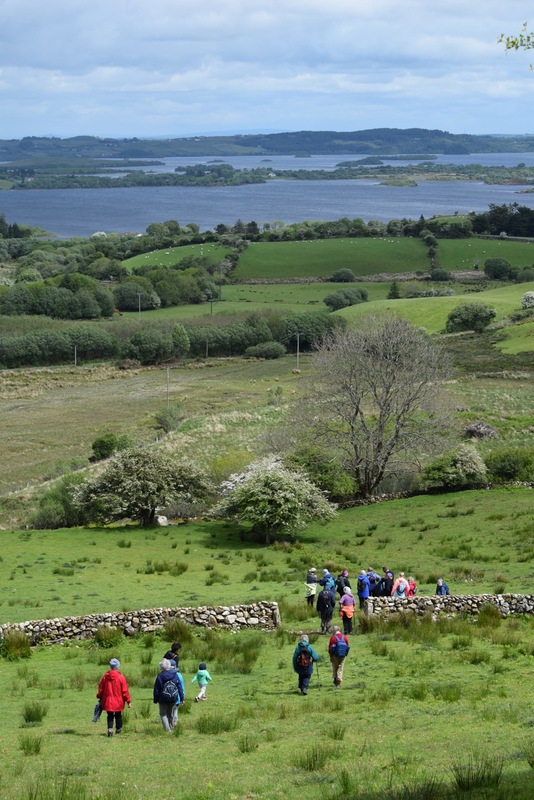 Members contributed to other walking events such as the Joyce Country Challenge and the Oughterard Trails weekend. A 3 year old guest made it unaided over the whole 8 km of the May Glann Green Road walk without complaint, and even found time to feed donkeys! Mairin and Brian Buckley showed off their new deck to great effect in August, with good weather and a large post-walk crowd who consumed great quantities of goodies above the deck. Thanks to Laurie for hosting her annual Corrib Ramblers potluck at Leam in September, enjoyed by all and fueled by suitable liquid refreshment. The three walking-away events in 2017 were a great success:the summer weekend in Westport, the Camino, and the Christmas party weekend in Clifden. 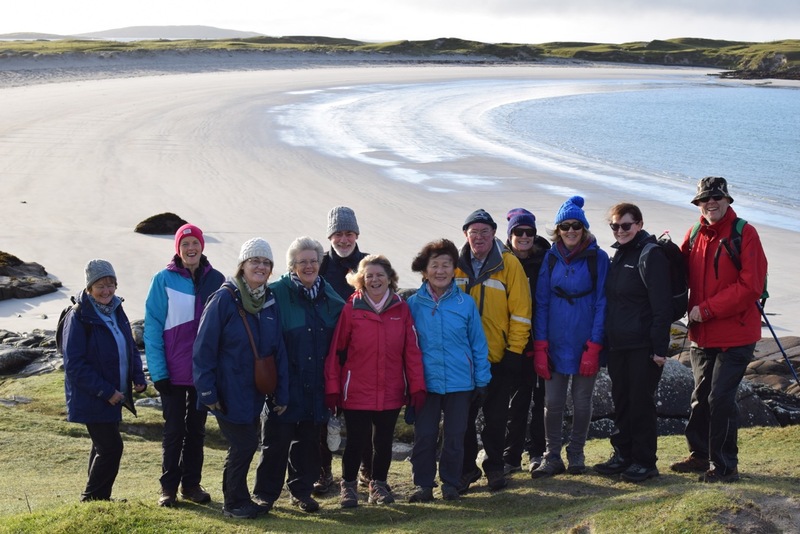 We continued our Islands visits this year with a fine summer walk around the quiet lanes of Inis Oirr, featuring great views, historic sites, lots of birds and wildflowers, and the resident dolphin. Here is a selection of walkers’ accounts of individual walks they made in 2017. 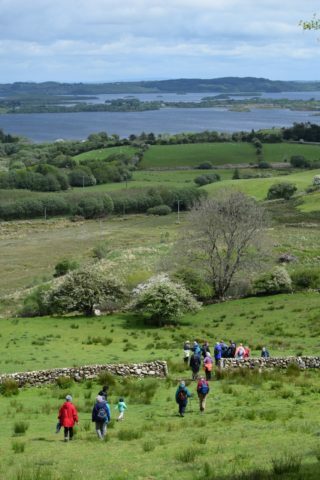 On 07 May, a sunny and cloudless day towards the end of the dry spell in Spring, we walked up from the Protestant Church in Clonbur to Lough Coolin, first on the mainroad, then on a side road and eventually onto a marked trail through trees. We walked around the lake, mostly on a green road not far from the shore, through a treeless landscape. We stopped for our picnic lunch at a ruined village on the North side of the lake, and encountered various groups of people enjoying the environs, including another walking club, fishermen and individual hikers. After lunch, continuing our walk around the lake, our serene and mellow mood was suddenly shattered by an almost-silent drama unfolding below us on the shores of the lake, where a large friendly-looking dog was randomly chasing ewes and lambs, forcing some to flee to the upper reaches of the steep slopes, but others unfortunately fled into the water, where two ewes were drowned (as once in beyond their depth, they were unable to move with their thick fleeces). However, there was one heart-warming episode, where a lamb had fled into the water with his mother, but realising that his mother was no longer moving, swam back to the shore, regaining the safety of the grassland only after many attempts to negotiate the rocky shore. In the meantime, the dog had run off around the lake. Later, we encountered some German visitors who explained that the dog, which had long since disappeared from view, had insisted on accompanying them from a farm below in the valley; we assisted the visitors in locating a farmer and identifying both the farmer who owned the sheep – needed to urgently take the orphaned lambs in charge -, and the owner of the dog. It appeared that these farmers passed us on the road as we were returning to our cars. 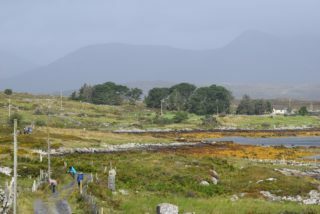 On 17June, 8 of us appeared to have no problem walking the full distance from Newport to Mulranny on the Great Western Greenway: 19.3k in 4-4.5 hours, not counting the stop-off in Yvonne’s Cottage Cafe for light refreshments. 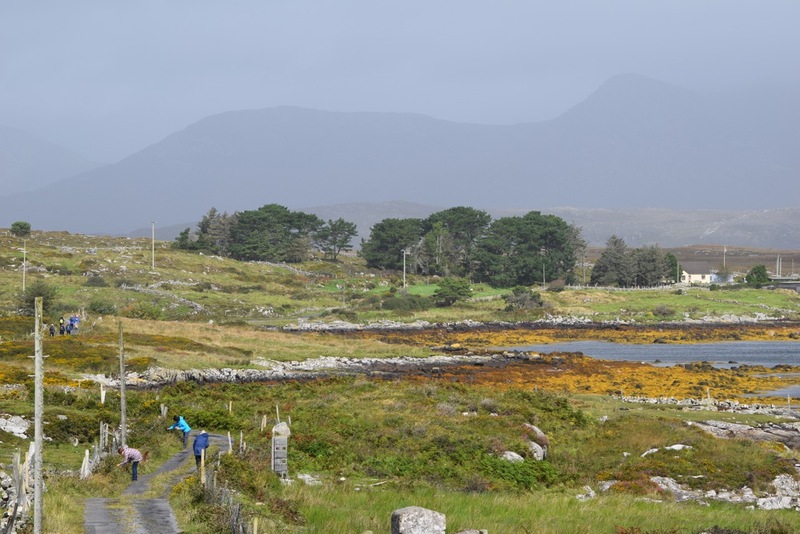 The 7 who cycled could only manage one way, except for Barbara who easily managed to cycle there and back, arriving back in Newport in less time than it took the rest to painfully peddle into Mulranny, mostly with sore bottoms. Having rendezvoused at our hotel, Hotel Westport, at 10:30, we drove to and parked at Newport Harbour. The walkers – who left the cyclists behind to get their gear together – were quickly well into the countryside. The day was overcast and about 17 degrees so ideal for distance walking, although according to the cyclists was not ideal for cycling due to a cool and moderate headwind. After crossing the Burrishoole River by an impressive ancient bridge, the walkers picked a nice spot to sit down for a picnic lunch, without as yet any sight of the cyclists, which was worrying as one would have thought they should have long since overtaken us on their latest technology! We were relieved when, as we were tucking into our sandwiches, the cyclists slowly appeared from the rear, toiling into the headwind, and informed us that it had taken a long time to properly get all the high-tech gear together and learn how to use it. 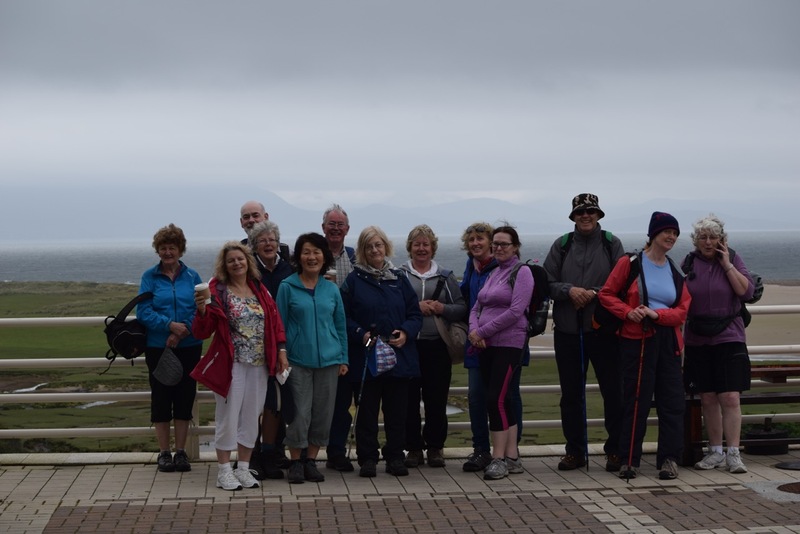 After lunch, with the cyclists now ahead, the walking was pleasant and easy, with extensive views across Clew Bay beginning to open up. The walkers made three stops before Mulranny, firstly at an inscrutable pair of recently-erected statues, described as “Man and Woman” although no-one seemed able to know which was which, although plenty of theories were put forward, most of which would not pass the censor for this account. (Barbara mysteriously appearing from a side road leading to Nevin’s Pub) The second stop was at the portable bogs (bright blue in contrast to the brown ones we were passing through), although the leading man bolted passed the large “women only” sign into the women’s before being shouted out of it and into the men’s by fellow travellers. The third stop was at Yvonne’s Cottage cafe for their much anticipated and celebrated soup; however, the cyclists had already decimated the soup stocks, so we were left with a scone. Having thankfully arrived at Mulranny well ahead of the appointed time for the minibus to take us back to our cars in Newport, we found the cyclists busily decimating further stocks at the Greenway cafe. With no sign of our minibus well after the appointed hour, the driver was eventually contacted and we were informed that he had had an accident, so we should look for alternate transport! We were taking a group photo at the time, beside a filling station, so we asked a minibus driver who happened to be filling up nearby, if he might provide this service, and – amazingly – he could! Regarding payment, he said that whatever we could give would be OK, but that he could only take 14. Because our super-fit cyclist had already cycled back to Newport, we were a total of 14, not the anticipated 15. So we all piled into his minibus and headed back to Newport. Many of us were planning to go to 6:30PM Mass in Westport or were in need of a sooner-the-better bath, so all was grand as we sped towards Newport – until we took an unexpected turn down a very narrow road towards the sea; our very gracious and helpful driver, Jackie Rumley, acting as local guide, decided that while we were in this part of the world we should detour to the various sights that are worth seeing. We arrived at the famous Grace O’Malley stronghold of Rockfleet Castle. After about 20 minutes discussing the history of the site and walking around the pleasant environs, we piled back onto our guide’s coach and set off for Newport, except at a junction which had a sign reading 6k to Newport, he again suddenly went off on an even smaller road signposted “Furnace”, leading for about 20 minutes through a wonderful landscape of drumlins, lakes and rivers. At this point, as the bath and Mass seemed to be receding by the minute, a head of mutiny was building up in the rear of the bus, so with Joe and myself in the front seat with Jackie, we had to keep him talking so that he would not hear the ever-louder but less-than-amused and ungrateful comments wafting up from the rear. When we eventually returned to the main road, it was at a junction whose sign read 5k to Newport. Having carefully explained to Jackie that we intended to go to 6:30 Mass in Westport so that we really didn’t have time to see the other five places this evening, he brought us straight into Newport, except that he took another detour through the quays at the last minute, before dropping us conveniently in front of our cars. Regarding payment, there had been two schools of thought; either Jackie would fleece us for all the guiding, or he would not charge us at all as he was obviously enjoying showing us around. When Joe offered him the rate that he had negotiated with the original coachman, he said it was too much, but Joe persisted and we said that he would be welcome to give any extra to a charity of his choosing. We emphasised that it had been such a wonderfully-entertaining and educational ride, and would love to return to complete the tour of the other sites. He was full of useful information, including his work to improve access to the countryside through “Keep Ireland Open”. We arrived back in Westport in good time for Mass and baths, before sitting down to an excellent meal provided by the hotel. However, apart from the usual late drinkers, everyone hobbled up to bed as soon as possible. On 18 June, after a wonderful buffet breakfast at the Hotel Westport, we checked out and assembled in the carpark, and drove in convoy the short distance to the start of the Inishnakillew and Inishcottle Islands walk. [Except for JP and Christine who used their SatNav instead, ending up on the far side of the county and had to phone for directions.] This walk was designed to be anything between 30 minutes and 3 hours depending on how much time was available and how sore members were from the previous day’s excesses. It was out to two islands in Clew bay, walking on causeways, and around the islands on beaches (actually on stoney headlands as the tide was in). Amazingly, everyone walked all the way down to (and back up from) the second island, even though the highlight was reaching the top of the hill on Inishkillew, the first island, which had a great view over Clew Bay to Crough Patrick. This walk had to be abandoned half-way through because we met so many heritage characters along the way that there was little time for actual walking, only talking. It took us 3 hours instead of 1.5 hours to get to the half-way mark, marked by lengthy exchanges with David Luxton, skipper of the Corrib Princess boat to Inchagoil and Cong, a poetry presentation by a local poet, Matt Molloy, who we happened to meet along the way, and a review of the mushrooms and donkeys at Bog House, the converted cottage of Doc Gilbert, with local celebrity Amelia Joyce in attendance. Apart from these living heritage stations, and the usual built heritage stations, other stations included the site of the springtime flush of Marsh Marigold by the village sewerage outlet into the lake, the site of the new village water treatment plant under construction, and a fine bank of blackberries which further delayed the group as they filled their sandwich boxes with the juicy black gold. Joe’s socialist tendencies were severely tested by a strike which resulted in their flight from Dublin to begin the Camino being cancelled, the team finally arriving at their destination via a suicidal middle-of-the-night bus journey at 4AM the next morning, instead of at about noon the day before. The first day’s walking was relatively short, a mere twelve kms, but was exhausting due to a lack of sleep, the hot sun, and the need to climb over the Pyrenees. Joe reports: “however, I stopped grumbling to myself when Una and I met Sarah and Yvonne from Canada at the end of that first day. Yvonne was visually impaired, so instead of using a regular walking pole she had a specially adapted white stick, and the arm or shoulder of her trusted friend, Sarah. I gave them one of our Corrib Rambler Club leaflets”. Una asked two men if they were in France or Spain only to be told: “this is the Basque Country”. Joe remembered having a snack sitting on a low wall of a genuine Roman bridge while eating a baguette filled with fresh tomatoes which they had just bought in a Spanish “supermercado”; the sun was shining down and “I didn’t want to be anywhere else in the world”. Joe’s conclusion after returning from the Camino: “Would I go again? Yes, Definitely”. Christine reported her astonishment that Joe, following a punishing 23km day on the Camino, hadgone for a walkafter dinner with the excuse of looking for fruit and veggies, but instead had enjoyed a Guinness at an Irish pub, and concluded that “One can take Joe out of Ireland but you can’t take the Irish out of Joe”. JP enjoyed the variety of the Camino experience: the difference between plan and reality, especially “theexciting James Bond like midnight chase around the hairpins through the Pyrenees” on the first night, instead of being in bed early; also, variety in the landscape such as “sun drenched fields, Foggy forests, windy mountain tops, roman roads, rural landscapes, cityscapes, rocks, rocks going up, rocks coming down, up again, down again, more up again, more down again, very varied indeed, not to mention the great difference between walking while rested and walking while very tired”. Amongst the culinary variety, JP and Christine reported that they had plopped down exhausted at one establishment and inquired if they could get coffee. “Sure,” was the answer, “but I have to finish some chores on the other side of the house first”. Noticing the washer and other machines that were kind of unusual for a restaurant to be in public view, I enquired whether the restaurant was on the other side of the house. With a sweet smile the house owner said: “we are not a restaurant, but you will get your coffee anyway”. Pilgrims are apparently deserving of much forgiveness. JP also reported a great example of spiritual variety:a fellow running a snack bar in the middle of nowhere advertised his enchanted box, which was quite large. If you needed a man or a woman in your life, you just had to leave your underwear in the box, and the magic would assuredly provide you with one. A Scandinavian pilgrim inspected the contents, noticing that the box contained mostly female undergarments. “That, my fellow travelers, is the main problem in the world” she exclaimed. The 10 December walk was probably the most bizarre of the year: a loop from Ballinafad new graveyard along the brand new (as yet unopened) Greenway to the back road of Ballynahinch and then through the estate on lanes to meet the Greenway again near Ballinanfad. Tom Cusack reports “ I was the only one to turn up at 10:30 in the carpark. I had heard on the radio that only essential travel should be attempted due to a sprinkling of snow and possibly ice, so given that Corrib Ramblers is always essential travel, I did the walk as planned; unfortunately, no one else had the same interpretation of essential travel as myself. Anyway, what a spectacular walk, definitely the best on-the-flat winter walk I have had in Connemara, we will no doubt be seeing more of it, especially when the greenway past Ballinafad bridge is completed; free range pigs in the woods, lashings of snow on the mountains, sunshine and a dry path, this day was another world from corrib country.” Joe, Una, Barbara, Gil and Tom enjoyed visiting most of this walk a few days later, when non-essential travel was reinstated. It is great to see the club bubbling with energy and good cheer, long may it continue and happy rambling to everyone in 2018. This page was added on 17/01/2018. Oughterard and the "The Faithful Companions of Jesus"
Remembering Men from Oughterard who Died in W.W.1. What Happened to Mark Mulvoy?